"If we claim to have fellowship with him yet walk in the darkness, we lie and do not live by the truth." In verse 6, John explains the character of one who wishes to have fellowship with God. His pattern of life must not be "in the darkness." Just as light and darkness cannot coexist in the physical realm, God and evil cannot coexist in the spiritual realm. To have fellowship with "light," one must live within the governing factors of its power. John goes on to explain the grave consequences of claiming to have fellowship with God while living in the dark - "...we lie and do not live by the truth." 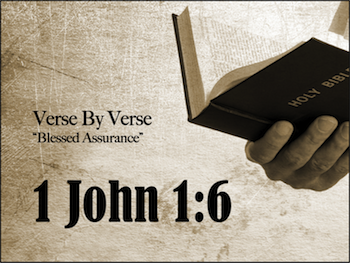 John uses the word "truth" frequently in his writings and often links it to the God/man, Jesus. Notice John 14:6, "Jesus answered, 'I am the way and the truth and the life. No one comes to the Father except through me.'" Jesus is the personification of truth. In other words, Jesus is our North Star. Life is a journey. In order to avoid shipwreck, we must submit to Jesus as the unchanging reference point that guides us. Truth is not relative. Truth is certain. It is constant and dependable. Truth is Jesus. 1 John 1:6 tells us that we cannot have a pattern of darkness in our life and expect to live within Christ ("truth") at the same time. As the world divides its loyalties between "darkness" and the "light" (1:5), it is the responsibility of Christians to point them to the "truth." It is also the Christian's responsibility to avoid a false security that comes from claiming to have fellowship with God while compromising with the darkness. Too many Christians are allowing their spiritual values to be diluted by the humanistic "darkness" of this world. They claim to have fellowship with God and at the same time embrace Pilate's version of relative truth. In such matters, John would say, they "lie and do not live by the truth." What about you? Do you believe in absolute "truth?" For assurance to be sure, we must let God speak for Himself. We must be true to the inspired context. After each week's study, read the entire chapter again taking note to the way today's verse relates to all the verses around it. Due to the colorful, complex nature of the original language, the best translation is multiple translations. Each week, this chapter will be presented in a different translation. This week Young's Literal Translation is featured. That which was from the beginning, that which we have heard, that which we have seen with our eyes, that which we did behold, and our hands did handle, concerning the Word of the Life --and the Life was manifested, and we have seen, and do testify, and declare to you the Life, the age-during, which was with the Father, and was manifested to us -- that which we have seen and heard declare we to you, that ye also may have fellowship with us, and our fellowship [is] with the Father, and with His Son Jesus Christ; and these things we write to you, that your joy may be full. And this is the message that we have heard from Him, and announce to you, that God is light, and darkness in Him is not at all; if we may say -- `we have fellowship with Him,' and in the darkness may walk -- we lie, and do not the truth; and if in the light we may walk, as He is in the light -- we have fellowship one with another, and the blood of Jesus Christ His Son doth cleanse us from every sin; if we may say -- `we have not sin,' ourselves we lead astray, and the truth is not in us; if we may confess our sins, stedfast He is and righteous that He may forgive us the sins, and may cleanse us from every unrighteousness; if we may say -- `we have not sinned,' a liar we make Him, and His word is not in us. Missed the first six parts of this study? Check them out! Back to Top of "Fellowship with Light"